From a Blue Devils press release: Going into its third year of operation, BDEntertainment once again is branching further into the event and sport entertainment world with its drum line for the San Francisco 49ers, "Niner Noise." The group will officially debut this Sunday at the 49ers' home opener at Monster Park in San Francisco. 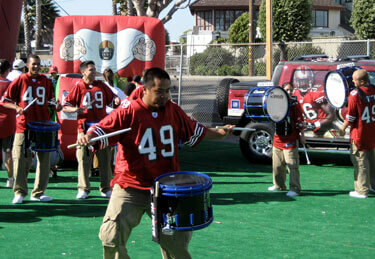 Niner Noise members in action at a recent 49ers preseason NFL game.